Nicky’s review (3 years old): “I liked the rat rollers. 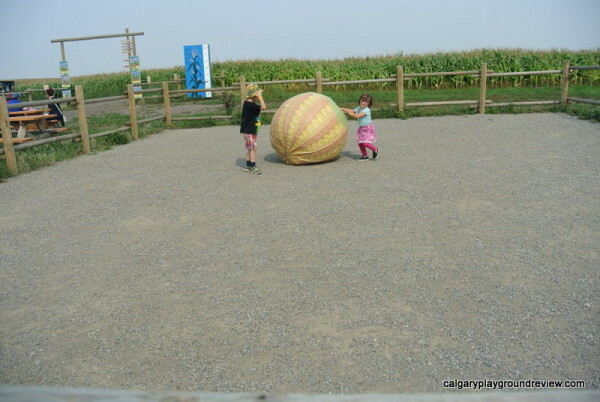 Robbie’s review (8 months old): Enjoyed being bounced on the jumping pillow. Annual Pass Break Even point: An annual pass will break even in 2 or 3 visits depending on how many people are in your family. Food Services: 3 shacks serving – ice cream, kettle corn, fudge, mini donuts, hamburgers, hot dogs, fries, chicken strips, drinks and snacks. 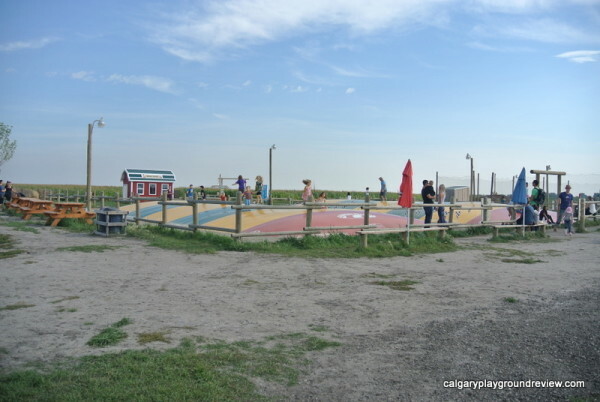 You are also welcome to pack a picnic and use one of their many picnic tables. 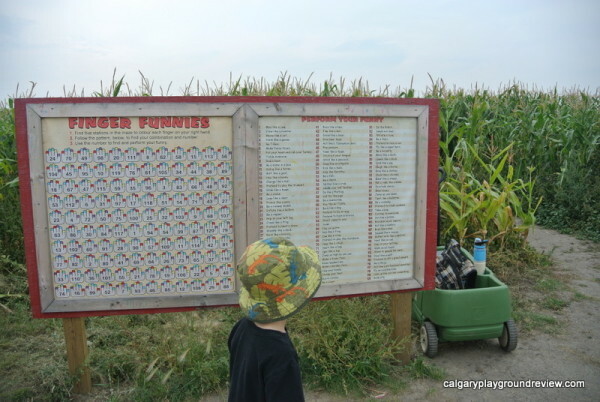 Overall: The Calgary Corn Maze and Fun Farm has been on my list for a few years now but for one reason or another we never made it down. This year we finally went and I’m really glad we did. Our visit was at the end of August on a Saturday morning and early afternoon. We were there for company event but aside from lunch and face painting the activities were the same as with general admission. 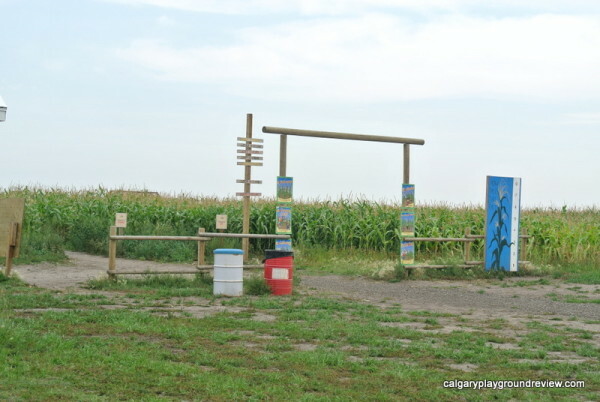 The Calgary Corn Maze and Fun Farm has a ton of different activities and is pretty easy to navigate because everything is so open. 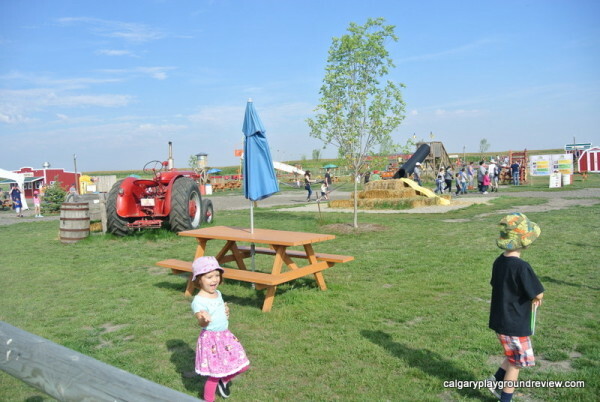 (Aside from the Corn Maze itself!) Most of the regular attractions will be covered in this review but I skipped over some of the smaller activities because there are just so many things. The train playground was a big hit with my train loving kids. 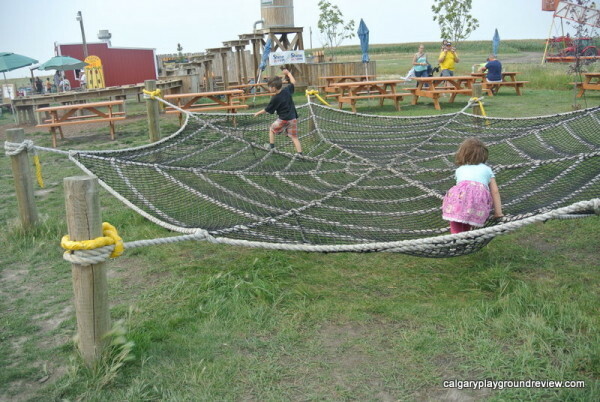 Both my kids like trying to climb up the rope tube and going down the twisty slides as well. 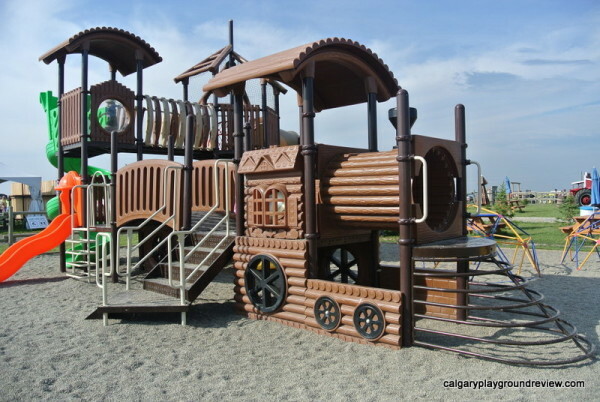 There is also a smaller climber for kids who find the train climber to be a bit too big and a couple dome shaped climbers as well. 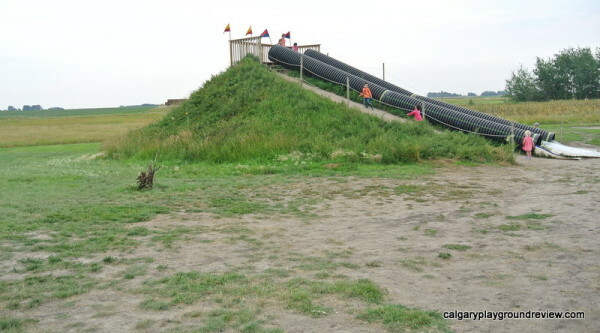 There is also a little hay bale tower with slides right near by. 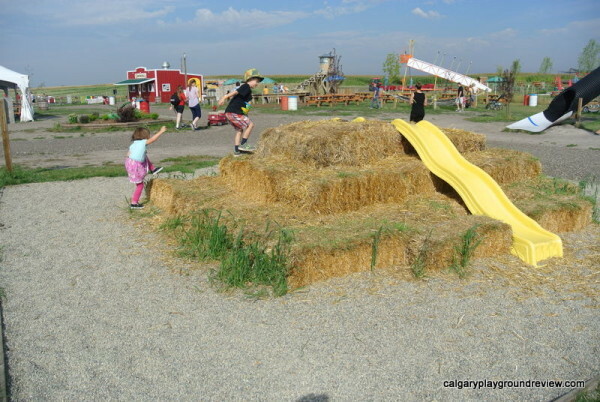 The Calgary Corn Maze is a great place for kids who like to slide. 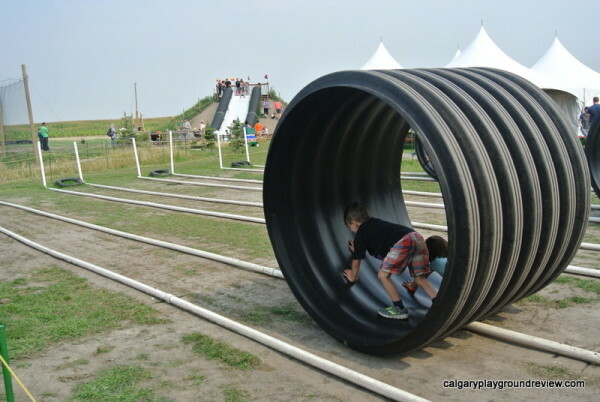 The tube slide is a bit of a bumpy ride. The Lost Treasures Mining Tower is an additional $6-$11 and is not included in your admission. 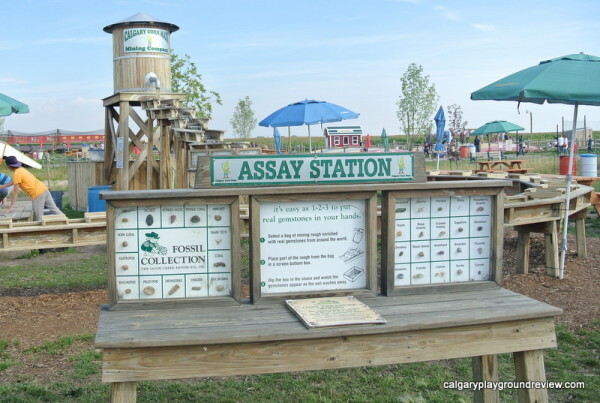 You can pan for fossils or semi-precious gemstones. 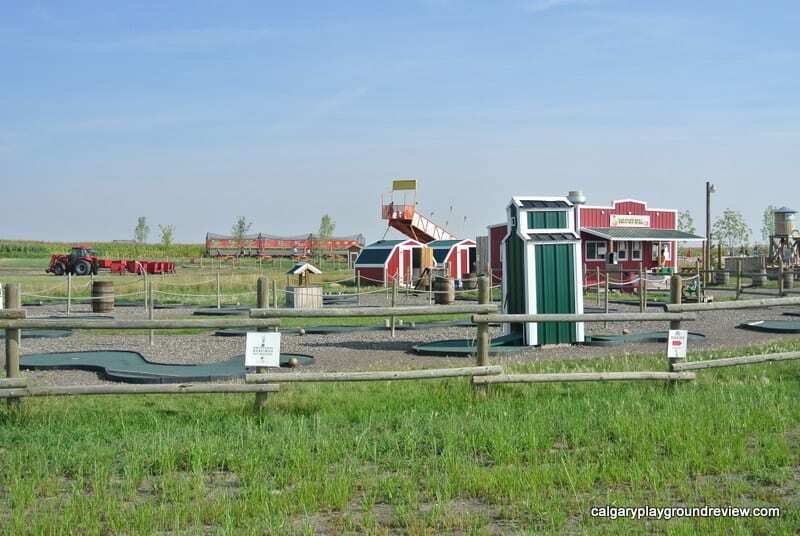 Right up but the entrance gate is a 18 hole mini-golf course. 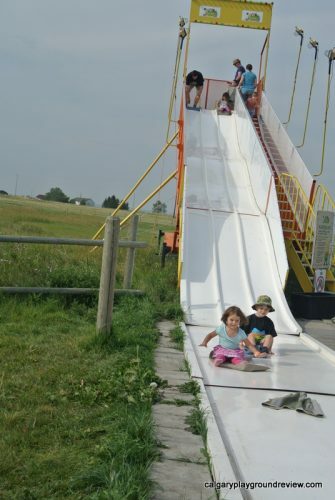 This ‘potato sack’ slide goes pretty fast because you sit on a piece of carpet while you slide down. Little kids may need assistance. My kids loved this. My kids were really excited to take the grain train. It runs at specific times so check the map as to when to head over. It’s a pretty short trip, about 3 minutes through a section of corn. 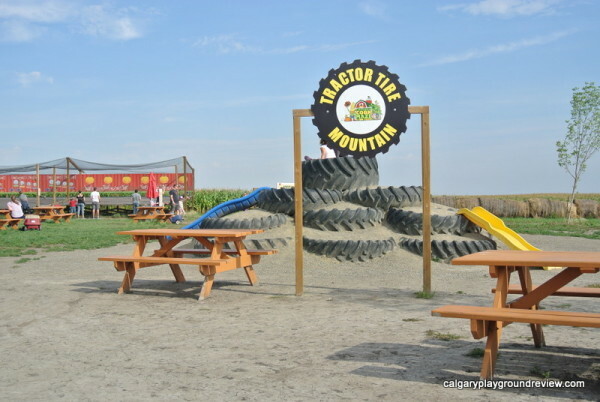 Tractor Tire Mountain climber with more slides. Ball toss with baseballs, footballs and basket balls. My son (6) found he was a little too short for these. 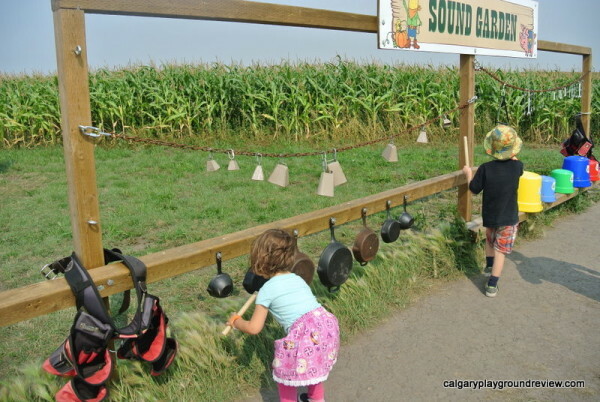 Right beside the ball toss is a sound garden with mallets, buckets, bells and pots. One of my favorite features was the jumping pillows. It’s sort of a cross between a trampoline and a bouncy castle. They have two set up, one for kids who really want to jump and one for smaller kids and families. All my kids enjoyed the jumping pillows even little Robbie. He actually fell asleep for a minute while laying on the bouncer. 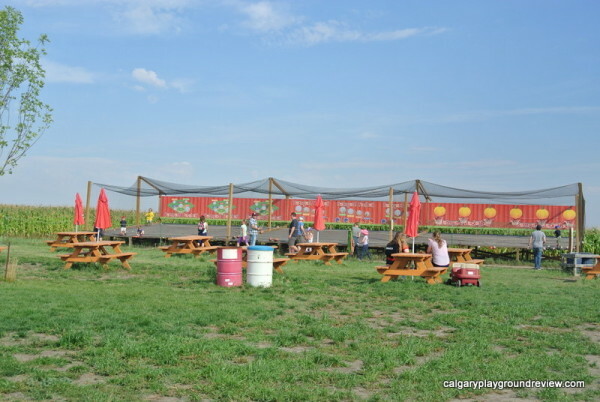 The Big corn maze is located at the North end of the fun farm opposite the entrance gate. We didn’t have enough time on this trip. 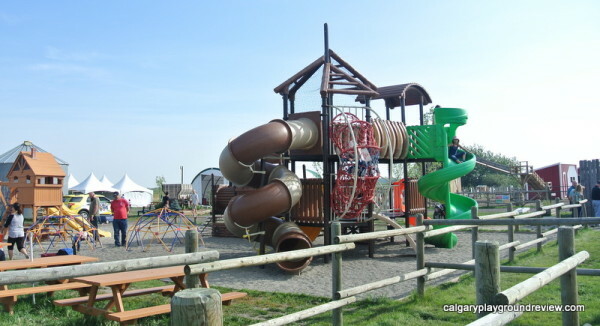 It is geared towards adults and older kids and covers 10 acres. It consists of two phases which you can expect to take 30-60 minutes each depending on how many wrong turns you take. Rolling around the ‘corny ball’. Stalk pedal carts. There is two one-seater and a 4-seater pedal cart that you can race around a track. The hill slide is really tall. 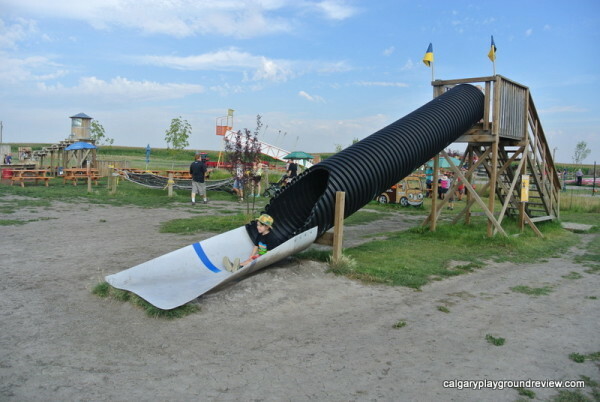 There are two tube slides and in the middle a flat slide too. My kids did this over and over again. Friendly Fire costs an additional $3 per play and is not included with admission. You and your friends use modified paint ball guns to shoot foam nerf balls at each other. Gordie and Nicky both thought these ‘rat rollers’ were a lot of fun. You can crawl or walk to move them along the track and then back again. 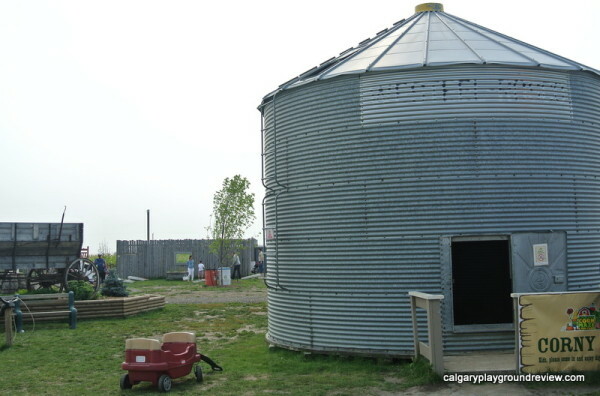 The Corny Bin is a grain silo filled with sand for the kids to play in. 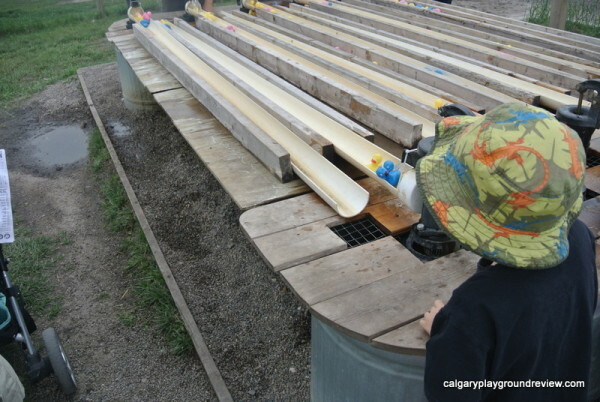 The water pump duck races were also a lot of fun. The petting zoo area has a lot of different animals including kittens! 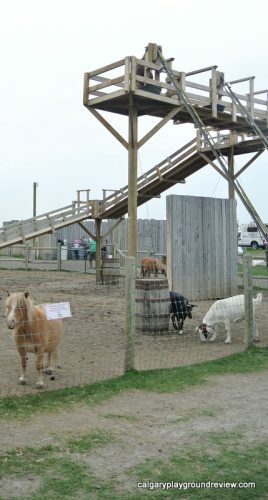 You can also feed the goats on the goat walk 25 ft up. 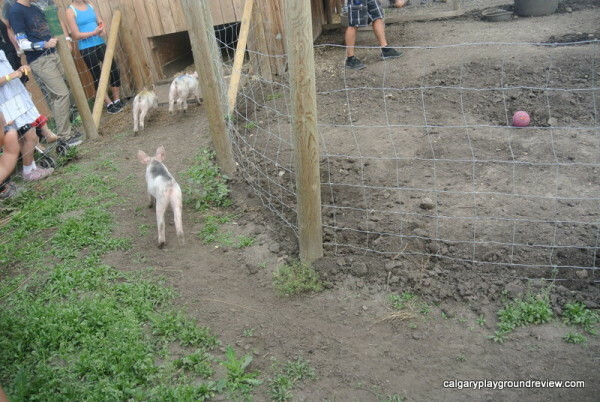 They also have some other cute things like pig races. 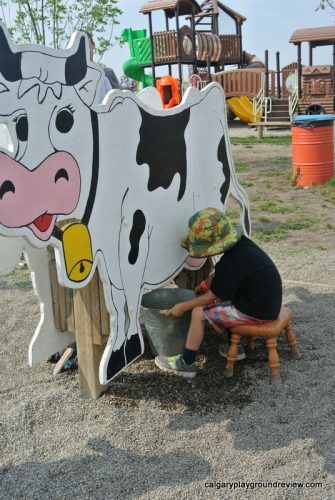 Gordie really really really wanted to try milking the cow. 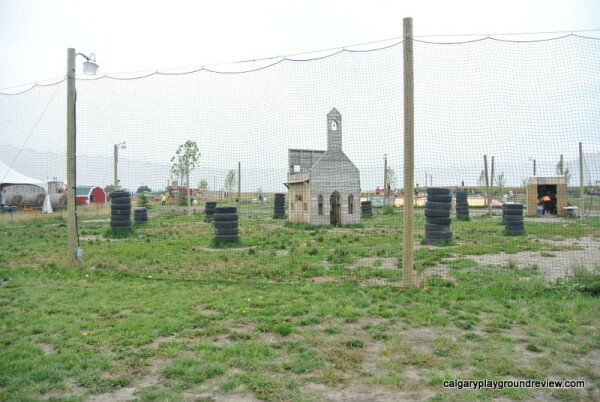 The small corn maze is located on the same side as the entrance on the south side of the fun farm. It is 3 acres and should take about 20 minutes to find the 5 color stations inside the maze. At each color station you rub the color on one of your fingers. Once you’re out you match the pattern on your hand with the chart and do the matching silly thing. My kids loved this maze although we only managed to find 3 of the colors before we ended up having to go for lunch. Trying it again is at the top of our list for next time. 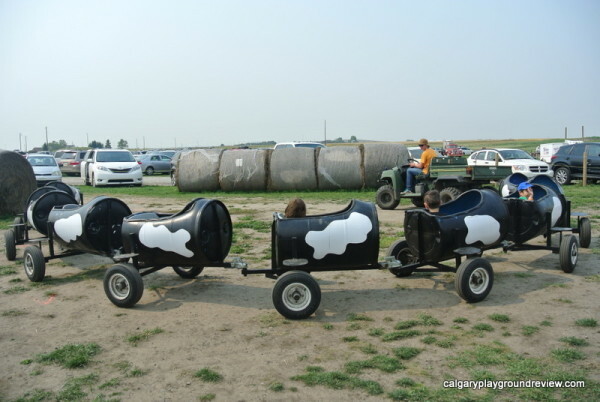 The highlight of our trip for my son was the cow train. 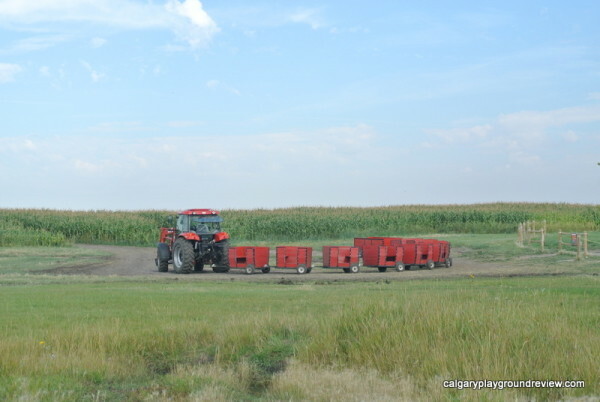 It runs every half hour or more often if the farm is busy. 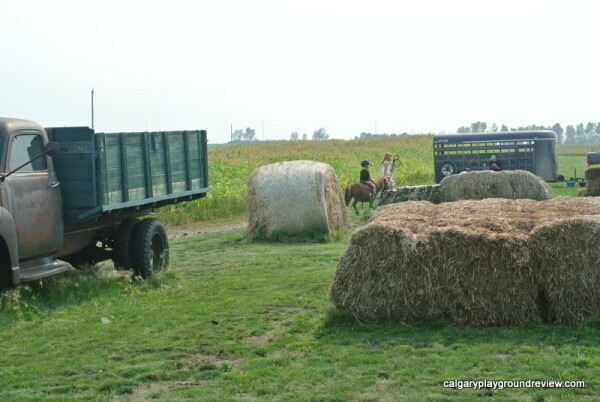 I didn’t see it listed on the map, but they also had pony/horse rides (no extra charge) while we were there. Nicky (3) went on while I held her waist walking beside and Gordie (6) rode by himself while his pony was led around a little loop. 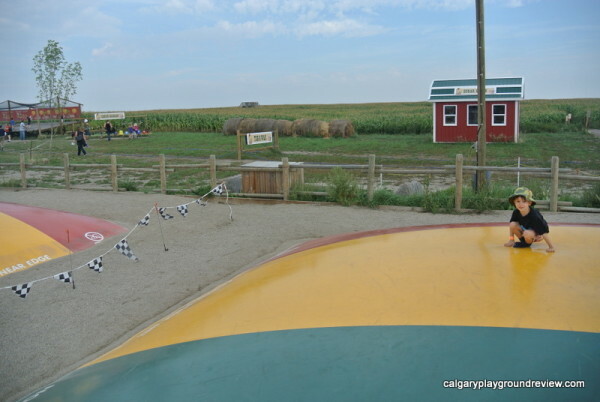 We had a great time at the Calgary Corn Maze and Fun Farm and will definitely make a trip back again soon. 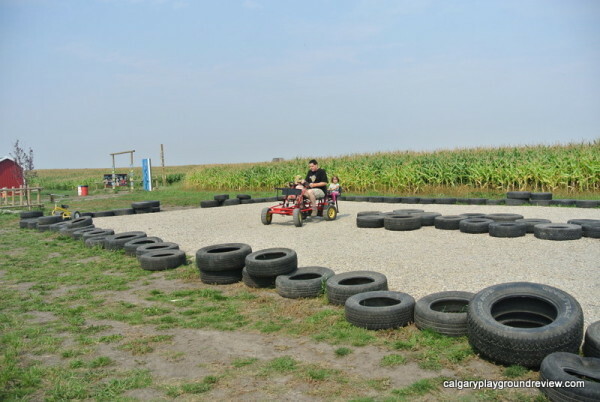 Have you been to the Calgary Corn Maze? What did you think? We went for the first time at the end of August and loved it too! The only thing I would add is to bring a lunch if you can. The food was overpriced, not great and really unhealthy. But we saw several families brought in their own food. We will when we go again. We went here last weekend and it was absolutely AMAZING! There were probably thousands of people there but it didn’t feel crowded at all. There was so much to do and my girls (1 and 2) just loved it. Every age would have a blast. Thanks for the detailed review!